Discredited journalist Ella Jerome isn’t thrilled about working at Adelaide’s fanciful tabloid the Informer. 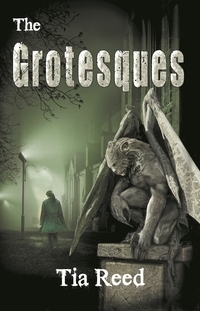 So when zoologist Adam Lowell seeks her help in finding his missing cousin, she’s cynical of his claim a monster lurks near the Church of the Resurrection. The trouble is, solving the gruesome case could be her best shot at restoring her reputation. With her old instincts resurfacing, Ella combs the Port for clues. Experience tells her the only monsters are the human variety, and the bloodied stonemason certainly raises her suspicions. But when her investigation turns up everything from petrified remains to the headless carving of a dragon, the truth threatens to steal both her sanity and the man she’s falling for. After all, gargoyles can’t be anything other than harmless stone. Or can they? Tia Reed loves nothing better than burying her nose in a story of her own making and cuddling her bossy cat. She takes every opportunity to do both when she is not teaching English as a second language. Her other hobbies often take a back seat but include trying to tame her beast of a garden, hiking and travel. The latter has thrown her many interesting, sometimes hair-raising, experiences which she loves twisting into stories. Born in Malta, she now lives in Adelaide, Australia.